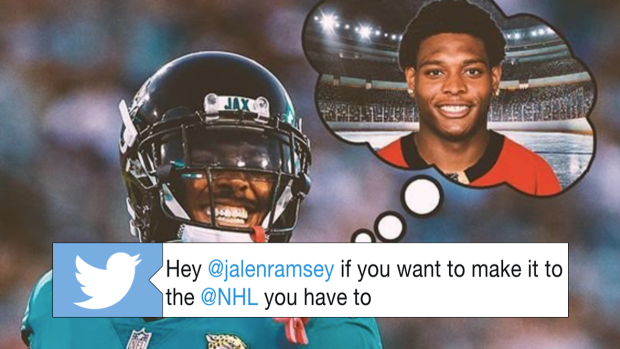 Jaguars' All-Pro cornerback Jalen Ramsey made headlines in the hockey world after saying he could probably crack the NHL if he dedicated 6 months of training with that one goal in mind. NHL players saw Ramsey's quote and didn't agree with it to say the least, especially when they found out Ramsey has never skated before. That might change sooner than you think, though, because an AHL team reached out to Ramsey ahead of training camp. The Springfield Thunderbirds are the AHL affiliate of the Florida Panthers and they want to be the team that Ramsey laces up his skates with for the first time. Seeing as the team tweeted this out before Ramsey's cryptic tweet about playing hockey, there's a chance this could be the team he's collaborating with. If it's not, we're still excited to see the collaboration and if Ramsey can back up his supreme confidence in his abilities despite having not skated before.